April 17, 2018 By Denny Hansen & filed under All Articles, Shooting Drills, Tactics/Training. MGM Steel Challenge Plate Rack comes packed in a sturdy reusable steel bucket that contains six targets, six hooks, and two beam hangers. 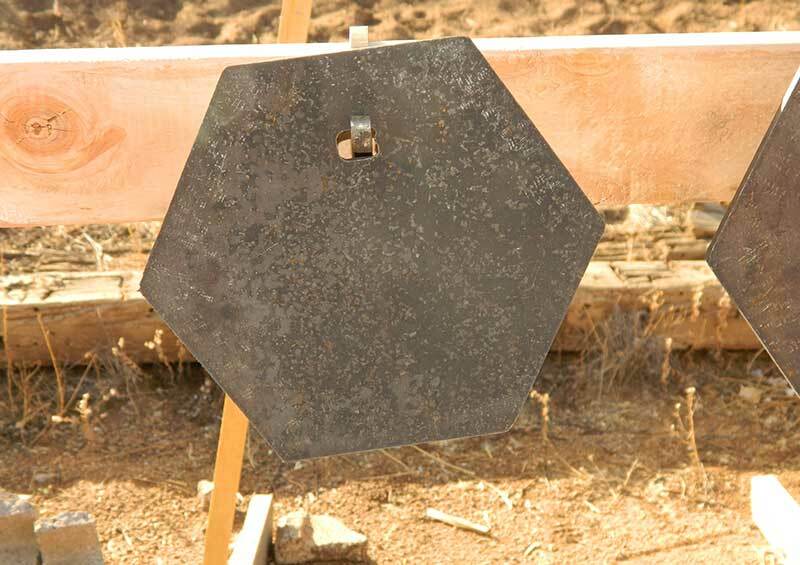 Shooting on steel targets has advantages and disadvantages. The main advantages are instant feedback (if you hear the ding, you hit the thing) and longevity. The two biggest disadvantages are the cost of steel targets and, since they are heavy, transporting them and setting them up at the range. Beam hangers have slots that accept a chain so a gong can be attached below the plate rack. I first saw the plate rack at a Ruger pre-SHOT Show rollout of new products at Gunsite in December. Jeff Hoskinson of MGM Targets offered to send me one to evaluate, and I enthusiastically accepted. The Steel Challenge Plate Rack comes packed in a sturdy reusable steel bucket. Contents are six targets, six hooks, and two beam hangers. The targets are made of the same 3/8-inch thick AR-500 eight-inch HexPlate™ hexagon-shaped target plates that the hangers are. All MGM targets are plasma cut, ensuring the entire target is structurally strong. Other methods, such as a cutting torch, can weaken the steel on the outer edges. MGM HexPlate shaped target offers 13% more area than same size round plate. A common mistake when referring to steel targets is that “AR” stands for armor. The actual definition is Abrasion Resistance, and the number after it refers to the Brinell hardness. The higher the number, the more abrasion resistant the steel is. 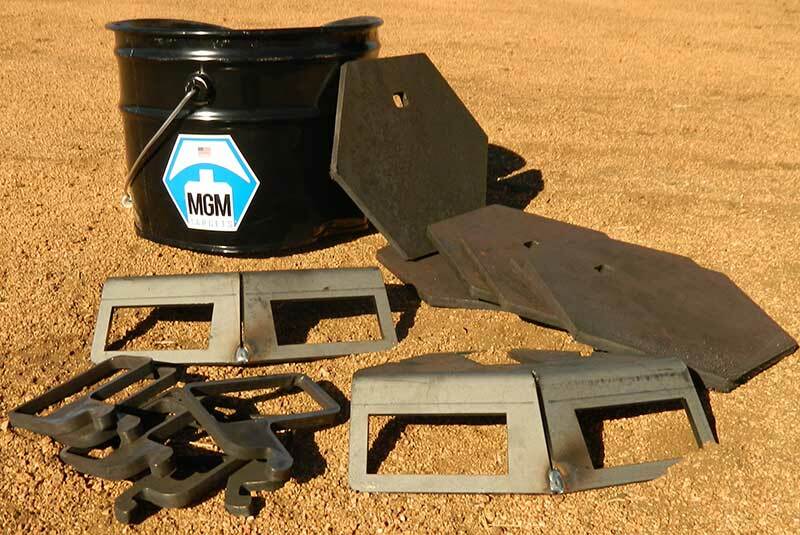 MGM’s exclusive MGM HexPlate shaped targets offer 13% more area than the same size round plate. Fully assembled plate rack. It took author only five minutes to assemble it with no help. Set-up requires no tools. 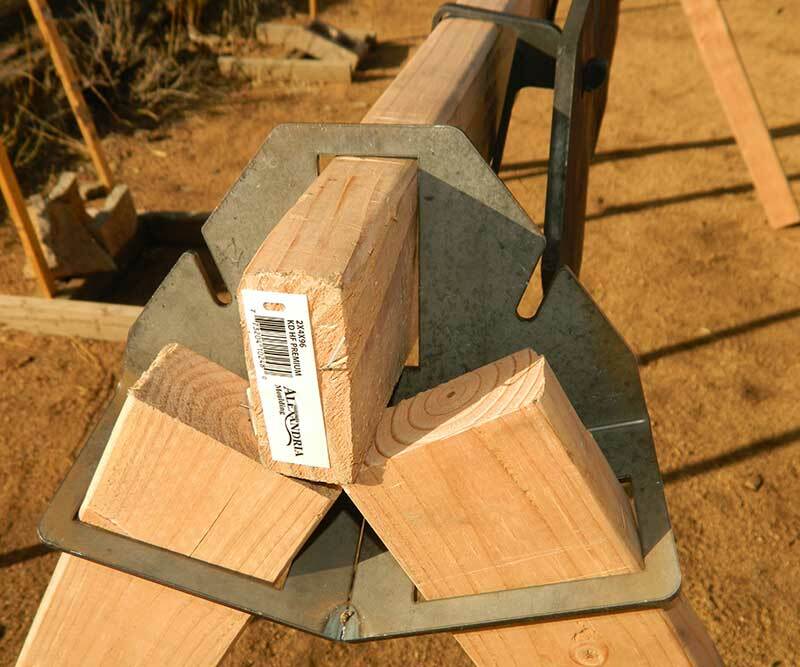 Set the beam hangers on 2×4 posts, slide on the target hooks, slide the beam into each beam hanger, hang the targets on the hooks, and you’re ready to shoot. An added bonus is that the beam hangers have slots that accept a chain, so a gong can be attached below the plate rack. Set-up would be a bit easier with two people, but I completed the assembly by myself in about five minutes. Resembling a small game trail, this is directly under the main beam. Rounds had been directed almost straight down. I spent $15 and change on three eight-foot 2x4s at the local hardware store (one for the beam to hang the targets on, and the other two cut in half for the four legs). If you are exceptionally frugal and have access to wooden pallets, the 2×4 on the sides of a wooden pallet could be used for the legs and even for the main beam if only two or three targets were hung. I was curious where the bullets would impact the ground. After about 100 rounds, what looked like a small animal trail was visible directly under the main beam, indicating rounds had been directed almost straight down. Painting steel targets increases contrast with a firearm’s sights, makes hits easier to spot, and prevents rust. 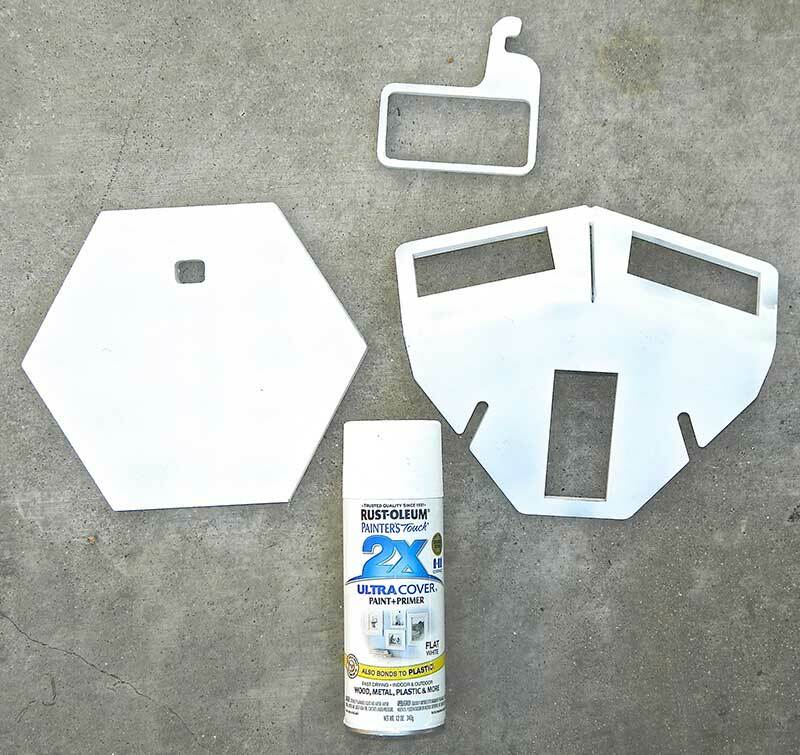 Rust-Oleum allows good coverage without having to touch up spots, saving valuable range time. Shooting at ten yards, I barely felt one fragment strike my face. While it’s always important to wear eye protection, it is critical when shooting steel! God only issued you two eyes—protect them. • At least ten yards from the target when using handgun calibers. • At least 100 yards from the target when using shotgun slugs. • At least 100 yards from the target when using rifle calibers like .223 and .308, and 200 yards for heavier calibers. The steel comes “in the white” with no exterior finish. I always paint my steel targets for three reasons: contrast with the sights, the ability to see hits, and rust prevention. Colors are an individual choice, but in my experience, flat white is hard to beat. Don’t go the cheap route and buy $1.99 spray paint. Once it dries, you will more than likely need to go back over it for good coverage, costing more in the long run and spending more time on a spray nozzle than on the trigger. Go the extra step and purchase Rust-Oleum—you can thank me later. 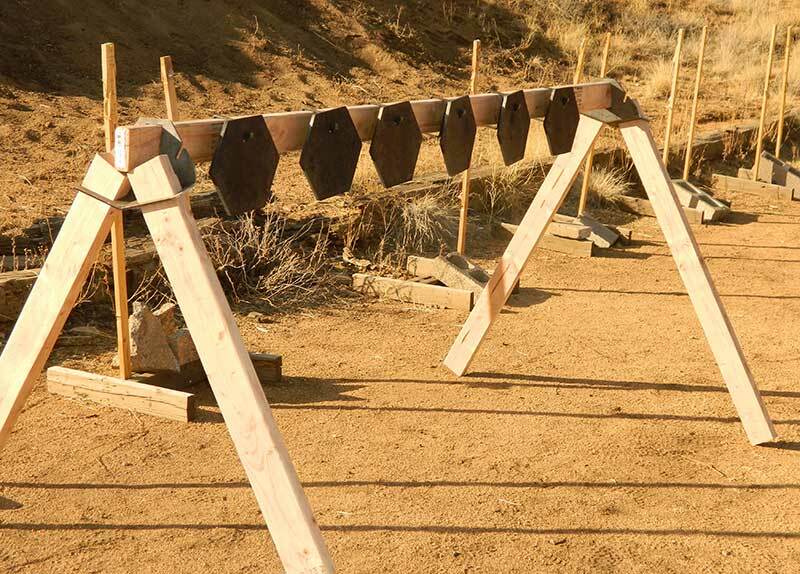 With the Steel Challenge Plate Rack, I will paint both sides and all edges of the targets, hangers, and beam hangers. Earlier I mentioned that cost can be a drawback to steel targets. The Steel Challenge Plate Rack sells for $299.00, shipping included, which puts it in the range of most budgets. In fact, MGM Targets ships all orders over $250 free in the contiguous USA. Breaking the cost down further, you receive six quality AR-500 targets for only $50 per target. And when you consider the ease of portability and set-up, the “plate rack in a bucket” represents true value. I am so impressed with the Steel Challenge Plate Rack that I won’t be sending it back. I plan to incorporate it with other targets on my range.